Is there frost in the forecast? Yep! That means the onset of the Annual Frenzied Midnight Annual/Houseplant Rescue. As per usual, I was out in the dark last night about midnight digging in near freezing soil with my bare hands. It was going down to minus 4 and I had a ton of annuals and plants to bring in. This below zero temp snuck up on me! It’s only the middle of October. Usually we’re ok till early November. Got my monster pots in first, then smaller ones. 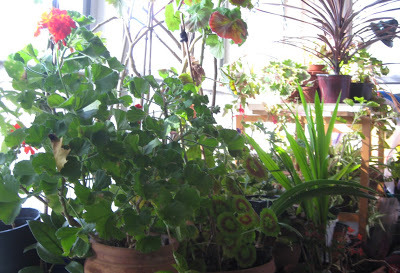 Was running out of room in my unheated sunporch, but stilll had to out to find a few choice things I had tucked into big pots. Did I wear gloves? Nah. Could I really see what I was doing? Nah. But in the tradition of “if it’s worth doing, it’s worth doing badly” I dug my nails in as far as I could and ripped those last few plants out unceremoniously with as much soil on the root as I could, and stuffed them into pots. They’ll have to wait till Saturday for a bit more TLC. 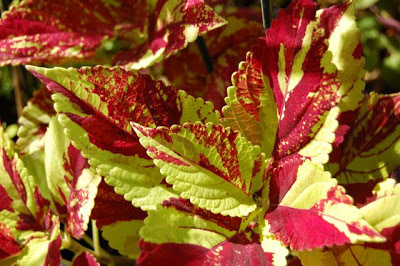 Amongst the refugees were 3 very fancy leaved coleus I had wanted to save, but were in pretty rough shape (dead?) from the night before. Grabbed them anyway. We’ll see how they do. At least this time I wasn’t in my pyjamas. When I realized that my in laws moved their plants each winter, I was shocked. Completely outside my experience. But it's good to hear that the same dance I do when a rainstorm is forecast — batten down the hatches, move the tools. Hooray for preparation. Thank you Helen! it's a good warning. I think I need to do this job before we hit low temperatures. Oh dear, if I were an annual, how would I have faired? Still waiting our frost…hope I have more warning than you.